KiKi, the Shorgie ~ Adopted! 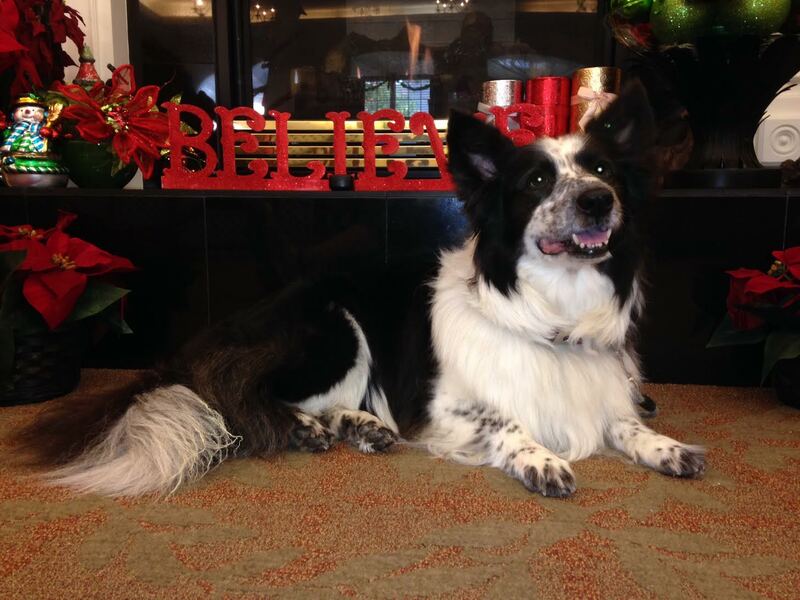 1/25/15 Update: Exciting news for Kiki, She found her family! 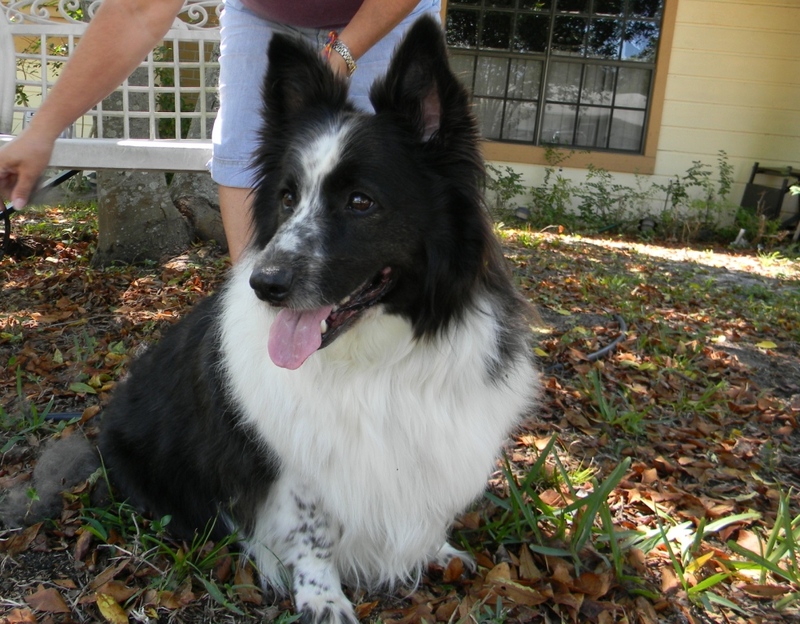 Pam and Art of Debary, FL fell for this little girl and decided it was time for her to be part of their family. Congratulations to them all! 12/22/14 Update: Unfortunately we received word that due to changes in her owners health Kiki needs to find a new home. Kiki would do best in a quiet home, willing to crate her when things get exciting, as visitors can make her a bit anxious. She is not a fan of Kitties, and is unsure of new dogs, but once she has time to adjust she can learn to be friends. Kiki is also a little unsure about younger children, so a home with older, or no children would be ideal. More information to come. Check out her Photos on Facebook. KiKi doing the Magpie Look! 05/30/12 Update: Woah! 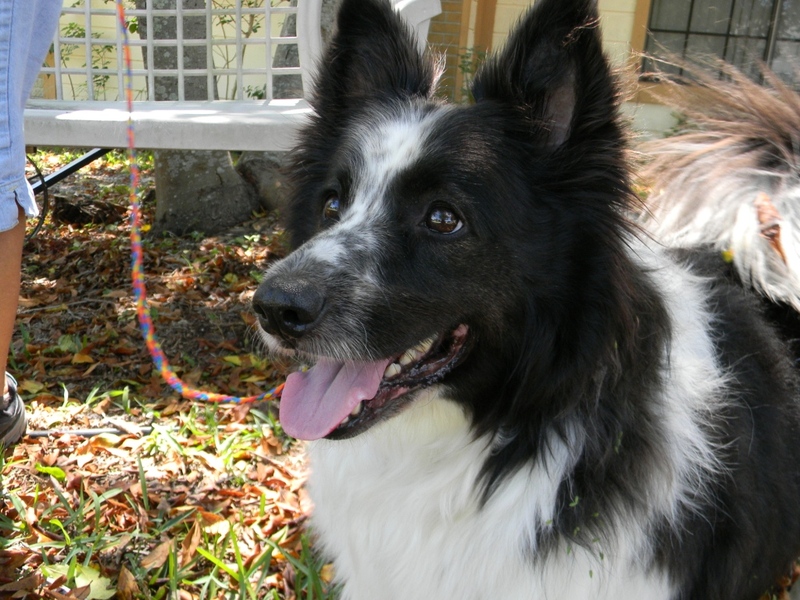 KiKi is most definitely a herding dog, and she is good at it! She has the low stare, the perfect stance, the focus and the desire to control movement. I’m not at all surprised. She has been shedding many unwanted pounds, is enjoying her daily walks and has accepted the fact that table scraps are not dog food! KiKi should be adopted by a quiet couple, with no young children (as she will nip to control) and no cats. KiKi would do very well on a farm where her talents and skills are needed. When handled by a professional, her herding and prey drive could easily be redirected with a frisbee, flyball or agility training. Marjie Wolfe, and Shelter Director Tracey Breen, send me several photos of this cute little thing. I was hoping I would find a way to make room for her, and I did! Kiki’s owner had to go into an assisted living facility after her health issues became a serious concern. Kiki is about 4-5 years old. She had lived with a pack of smaller dogs. She is a Sheltie, but a low-rider! She has Corgi legs and my daughter, Sarah says she’s a Shorgi! Unfortunately, Kiki needs to shed some pounds. I’ve been calling her Special K! Looks like her owner took very good care of her, and her dinner might have consisted of biscuits and gravy! She is an awesome little dog, housebroken, smart, loves to go on walks, does not bark like most Shelties. At first she reminded me of Garcon, and Tiny Tim…. then I saw her spots and said, Shenandoah (Connie), and who could forget the Borgies? They were one of the most stinking cute litters we ever rescued, but when the sunlight hit her face just right, I looked down at her and saw Magpie! 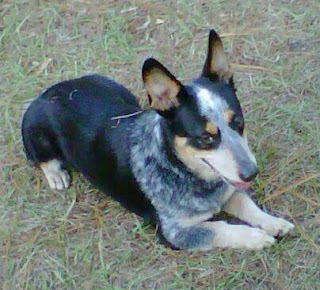 She is going to the vet this week, we will check for a spay mark, and if she needs to be spayed, we’ll take care of that! She has had all of her shots, and has been microchipped. Sarah paraded her around the neighborhood last night, and she was a major hit! Her giant photo album can be viewed on Facebook! Update: Yesterday was a hoot! We took KiKi to Val-u-Vet in Deltona to see if she has been spayed and to have her nails cut (they were pretty long). But before we got down to business, I asked all of the employees, (about 10-12) to guess her breed. Definitely Corgi legs, but is she a Border Collie or a Sheltie. It was split down the middle… Dr. Oliver guessed Sheltie because of her coat, and I agree. Others suggested Border Collie because of the spots on her nose and legs, and I agree. This is one dog that really should be DNA tested! So I’m no closer to suggesting if she’s a Shorgie or a Borgie! One thing is for sure, she’s a doll! Harry Potter, a Very Good Boy! Harry is trapped in a Corgi body with an Australian Cattle Dog (ACD or blue heeler) coat! They call them Auggies! He is good with other dogs, cats and older children. Tiny humans make him a bit nervous! Harry appreciates a calm home, adores going on walks, and is quite affectionate but not a velcro dog. Harry is a very polite little boy! 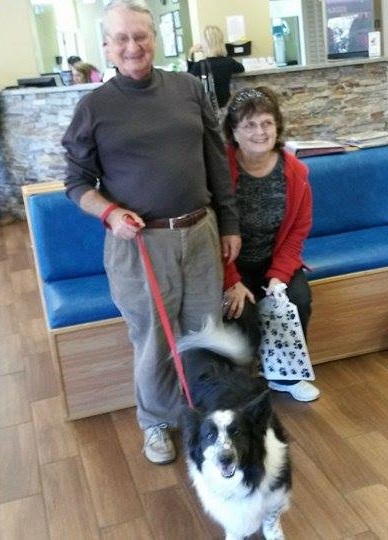 Update: Rex adopted Harry Potter! 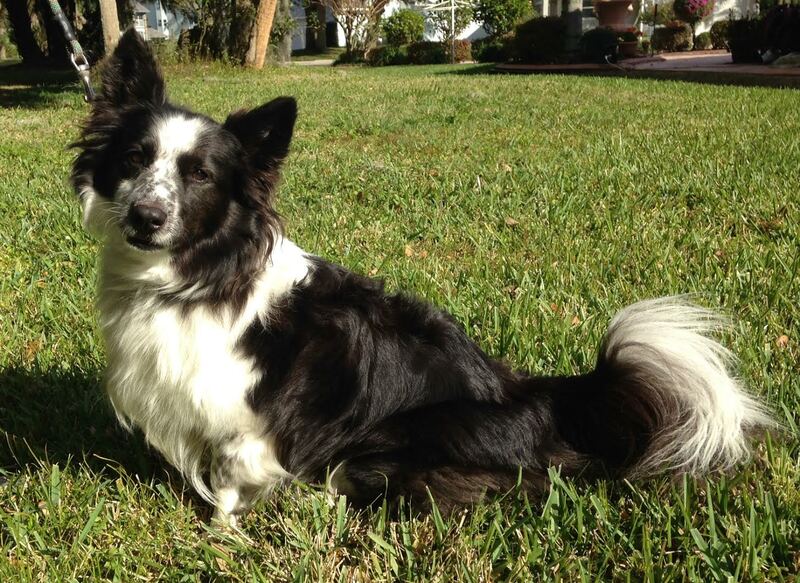 Rex is owned by Billy and McCarty in Orlando! We need to give these two boys several days to adjust to be sure it’s a successful adoption! This sweet girl is letting Josh clean her wound. Josh is making chicken stew! Amanda and Dr. Ed start working on Marlo right away. 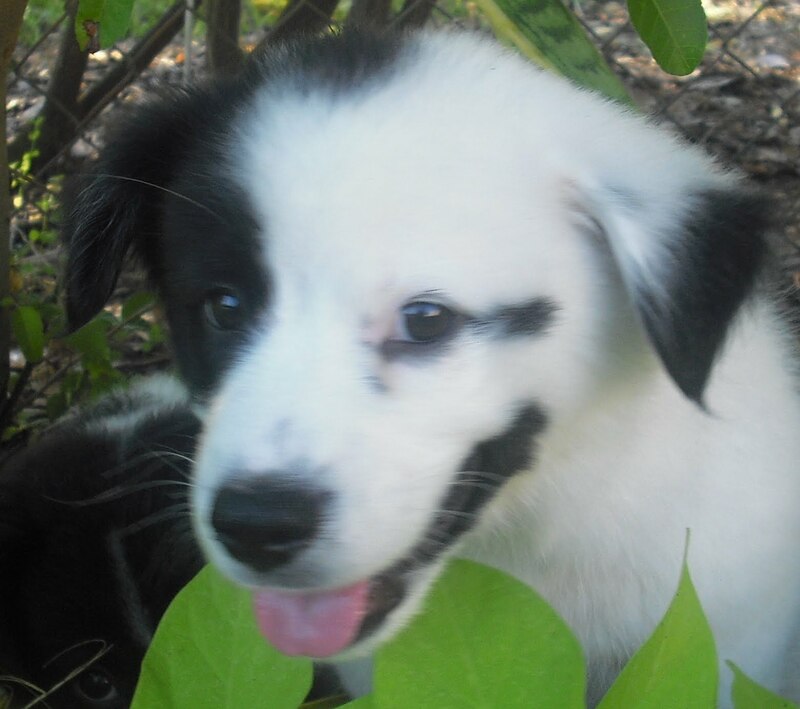 We’ve named her Marlo Thomas… yes, she is THAT GIRL! We’ve learned a lot in the last 24 hours that we will share shortly. For now, she is at Newman Vets of Deltona and let the technicians clean her up. She was covered in ticks and severely matted, she will need to be shaved down. 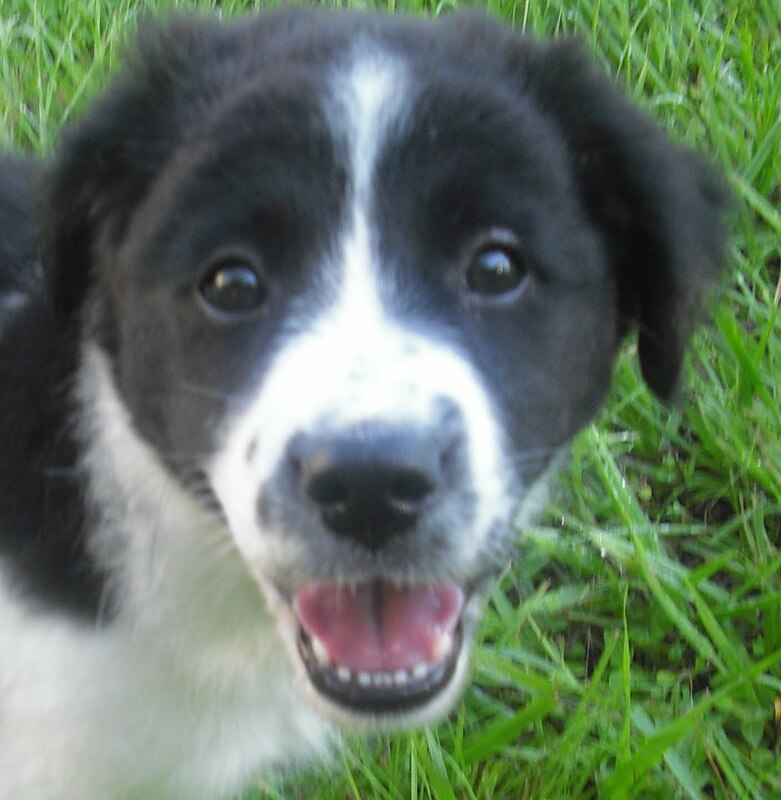 We believe she is a Corgi and either Sheltie or Border Collie. She is a low rider! Dr. Ed confirmed that the marks are a bite but a bite from what? We have received emails that she has been spotted on her own for many months from Marion County and Cirtrus County. Is it really her that people claim they have seen her? I think it might be. She does a very unique look to her. Dr. Ed believes she is about 2 years old, and she has been eating rocks! Her teeth are a bit worn down, but they are in good shape. She is truly a wanderer and quite happy living on the land, unfortunately this time, something got her. What’s in these woods? Racoons, Possums, Fox, Coyote, wild dogs and feral cats. We’ll never know, but whatever bite her, bit her good. Special thanks to Randy Post and his wife, who transported her to us today. Randy adopted Millhouse from us last year. You can see many more photos of her on Facebook. Marlo, ready for her foster home! Update: We met Marlo yesterday, her wound is almost completely healed. Johanna and Adriaan, along with their adopted TDL Dog Shep/Alfie are perfect for her. Marlo tended to gravitate toward Adriaan, his calm energy is what she needs! Boo Boo is all gone! More Updates coming soon! Please visit her Facebook Photo Album to see more great photos of her recovery! 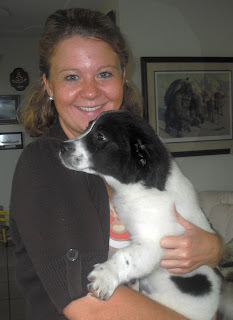 09/01/14 Update: Marlo was Adopted Saturday by Kristy. 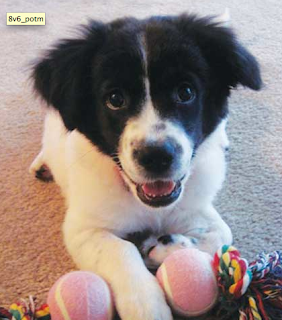 The moment we posted Marlo’s horrible photos of her injury, Kristy emailed us, wanting to adopt… but we had to wait. We had to wait for Marlo to get better, and the folks at Newman Vet, Deltona took care of that! And, we had to wait for her to be in foster care for a few days so we could evaluate her. Marlo is going to take baby steps in her rehabilitation, and we are confident that Kristy will help her along! Updates soon! We received about eight emails from people who wanted to adopt Marlo, and selecting her new home was not easy. Kristy lives very close by, which put our mind at ease, her dog has very calm energy, and her husband has a lot of experience being a dog-owner. We really need to give Marlo at least a month before Kristy can decide if Marlo is her forever dog! This little man is very young. He is polite and friendly. He loves to give kisses, and my daughter just loves him. He is not fearful and is doing very well in his crate. He did protect his food last night, which is understandable, he doesn’t know that we have more! We will be providing updates shortly. Little boy, a young pup, being transported to TDL this evening and available Friday! You can see more photos on Facebook. Update: He’s another Walmart Greeter! Quiet and loves his crate. Friendly and gentle with children and plays with other dogs. He’d make a great apartment dog but will need a lot of time to run and play at the dog park! His photos do not capture how cute he really is, so I’ll keep trying! 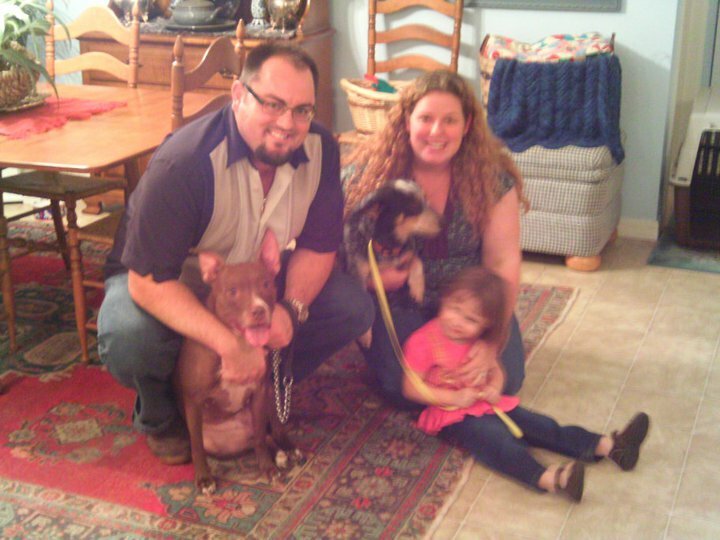 10/22/13 Update: JP was adopted by Matt & Kim of Tampa, and their two gorgeous little girls! 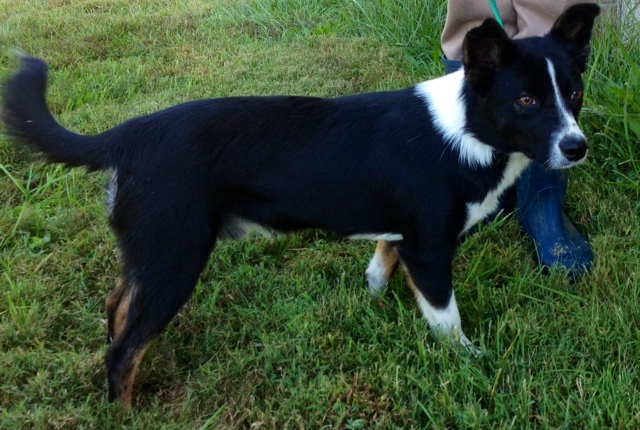 Tiny Tim comes to us from Athens Dog Pound, Alabama. He weights about 25 pounds, and is approximately 1 1/2 years of age. 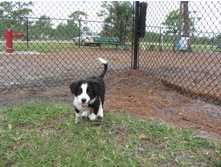 Megan is fostering him in Deltona and she believes that he is a Corgi/Cavalier King Charles Spaniel…. therefore we’ve defined him as a Corgi-lier! He is Corgi legs and a King Charles face. He is very happy romping around the house with Megan’s dogs. 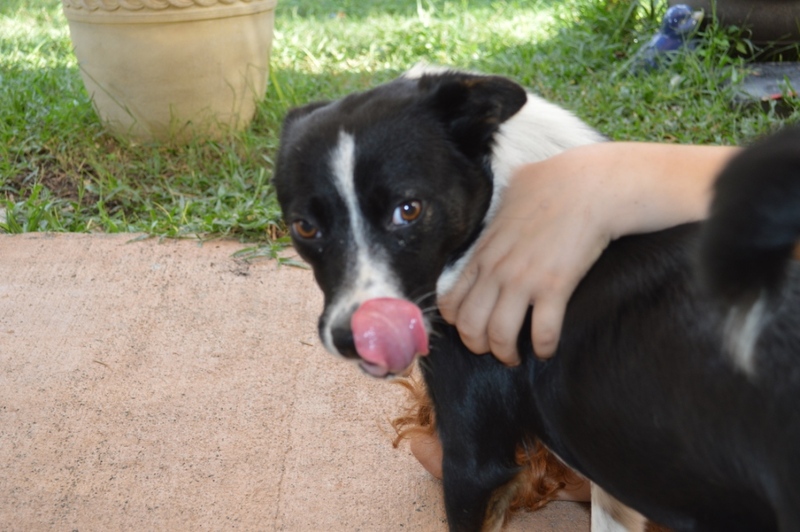 Tiny Tim is very friendly, playful and loving. More updates coming soon! Special thanks to all who helped rescue Tiny Tim, especially our Sarah who transported him to us! Click here to see more photos of Tiny Tim on Facebook. 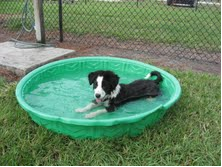 Update: Tiny Tim has been adopted locally, in Deltona, FL! Where did that tail come from??? Look at those little legs! I love his pink nose! This is a lap dog! He loves to give kisses, Caitlin doesn’t like to get them! Fitz Finnegan came to us from a shelter in Georgia that is over run by abandoned dogs. Sadly, 90 dogs were put to sleep there just the week before. When I saw this boy’s photo, I was determined that he would make it out. Sherrie Ford, a volunteer at the shelter, moved heaven and earth to get him to the vet in time for Kathy Keith to get him to our already-scheduled transport. Thank you ladies! I had been told that he was a Golden Retriever puppy, but when he came trotting through my door, well, let’s just say I recognize Corgi legs when I see them!!! You have never seen anything as cute as his boy, with his short legs, curled tail, and happy face. When he runs, he bounds along. He’s so young that sometimes his legs get ahead of him and he tumbles over. I try not to let him see me laugh, but I don’t think I’m fooling him! Fitz Finnegan is quite the player, chasing balls and Frisbees (the other dogs always beat him to them), but his favorite thing to do is sit in your lap and let you tell him how wonderful he is! My friends Lynne and Laurie came over today and he sat happily in their laps for quite some time. In fact, he sensed Lynne was real sucker and worked her over. If she had brought her handbag instead of a purse, she would certainly have snuck him out of my house! Okay, so best guess is that Fitz Finnegan was born around the end of February. Breed? Hmmm, Corgi for sure. I favor Golden Retriever over Yellow Lab. That curled tail…. I’m stumped. All I know is that every time someone meets him, they squeal with delight. Well, that’s not totally true. The women squeal and the men laugh. What can I say? He’s adorable! You can see lots of photos of him in his photo album. I’m fostering Fitz Finnegan in Winter Park. If you think that you might be interested in giving him a home, please read my Puppy Tips page first. Then, if you are still interested after that dose of reality, then read about our adoption process and e-mail me at holly.thedogliberator@gmail.com Thanks! Fitz Finnegan has found his forever home. 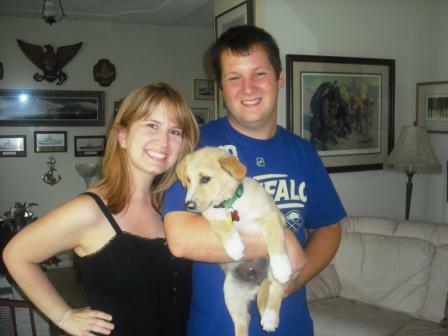 Jen and JL married less than a month ago and were ready to add pup to round out their new family. Fitz just adored them, and the feeling was mutual I think they are going to make a lovely family, don’t you? I couldn’t believe that two of the puppies looked just like my Kona and Kaz, who I was fostering at the time. I’ve been fostering for years and had never had puppies like this, and here is a second set? What were the chances??? The puppies arrived a week later and were, indeed are, adorable. Three boys, two girls. Three smooth, two fuzzy. Three stubbed tails, two full tails. What could they be? They are all rather low to the ground, and the golden has the look of a Corgi about her. With the mixture of tails, I could see that being in the mix. 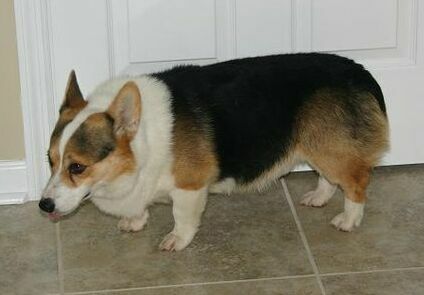 In fact, the photo of them with their mother shows her to not be a whole lot taller than them, so I suspect she is part Corgi. What else could they be? Well, I had thought that Kona and Kaz looked to have Bernese Mountain Dog in them, and I could see that in at least two of the litter. What else? Your guess is as good as mine! So, we’re going with Corgi Mountain Dogs! We believe they were born in early January and vary in weight from 11 to 16 pounds. They are quite the little crew. No one believes me when I say they are littermates. Glad I have the original photos to prove it. You can see them and more in their Photo Album. Chunky Monkey is a fuzzy male. Tricolored, he is similar in appearance to his brother Chubby Tubby but with a darker face. Also, he has a tail. He is the second largest of the litter, 15.4 pounds when he arrived. He is wearing a green collar. Adopted. 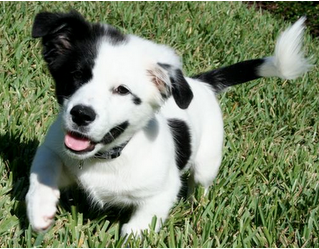 These puppies are being fostered in Winter Park, Fl. If you are interested in adopting one of them, please review our adoption process, then e-mail me at holly.thedogliberator@gmail.com . What a difference just a few days make! 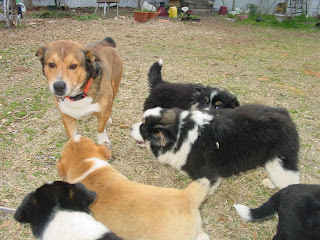 When the puppies first arrived, they were all very skittish. I don’t think that they were handled very much on the farm where they were born. They were certainly cared for ~ they’re healthy and plump, but not highly socialized. But that’s okay, this is what my family does. We play with the puppies, we hold the puppies, we talk with the puppies, all to turn them into wonderful family dogs. Cheetos was the first to respond to us. The first day I managed to pick her up before she could scoot away. She screamed like a rabbit (a common reaction) but I held her for a while, rubbing her ears and telling her it was okay. When I put her down again, she stuck by my side, and that is now where she likes to be. She is always the first to come running and to try to jump up in our laps. She is extremely friendly and outgoing. If Cheetos was first, then Chutney was second to come around. I didn’t have to force myself on him. I think he decided that since I didn’t eat Cheetos, I must be safe! When I put her down, he came right up to me. In no time at all, he was laying on his back asking for belly rubs. He is a brave little soul. When Chunky Monkey played too rough with his twin Chia, he went over and put his front paws on his shoulders and pushed him to the ground. Since Chunky Monkey is quite a bit bigger than Chutney, this tells me that Chutney has some natural leadership in him. I’ll bet he’d be top banana in a dog training class! Chubby Tubby decided we were okay the afternoon of his second day. He’d not been willing to let me approach him, but that afternoon I was outside playing with the puppies when I realized that it was Chubby I was petting! He’d just trotted up on his own and joined in the fun. He is now more often than not my shadow, walking around right behind me. Right now he is staring up at my loquat tree while it sways in the wind. I don’t think he realizes it is a tree! I was concerned about Chunky Monkey because he seemed so shy. That is so unexpected in such a big puppy, but there it was. He’d disappear under the hedge and not want to come out (I’m sure the fact that it was cooler under there had nothing to do with it! lol). 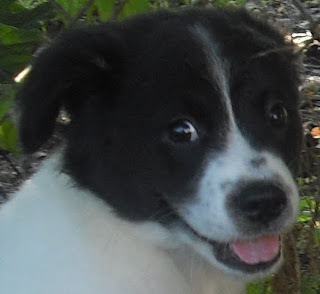 I was on the phone walking around the yard, talking to someone about the litter, the puppies following at my feet when one of them kept grabbing the bottom of my capris. I looked down and, well, guess who it was. Yup, Chunky Monkey! Ever since then he has been fine. I guess he has a capri fetish! He does tend to be a bit quieter than the rest and seems to prefer to be inside ~ he likes to hang out on the deck by the door. Because his coat is so thick, he may prefer the cool of the indoors. Chai was the hardest of the puppies to bring around. We just couldn’t get near her. By the third day we could tell she wanted to be part of the play ~ she’d come up the the crowd, work her way in, but as we reached our hand toward her she’d move away. But today was different. My husband was outside playing with everyone. I looked out and my jaw dropped. I said to him through the window, “Look who is under your hand.” He answered, “I know. She’s been here a while.” Chai is going to be just fine. As the day has progressed so has her self confidence. What would have become of her if she had been taken to a shelter instead to me? I fear she would have been permanently scarred. Instead, she has found the delight in being with people! Chutney just cracks me up! Today I put out a bowl of water with ice in it. All of the puppies thought the ice was great fun and played bobbing for apples with it. But then Chutney started stirring the bowl. Literally. He put his paw in and paddled to one side to the the water to swirl around. Then he’d watch the ice go around and around and around. When it slowed down, he did it again. I’ve had puppies paddle the water out of bowls before but I’ve never had one stir it like this. Just too funny!!! 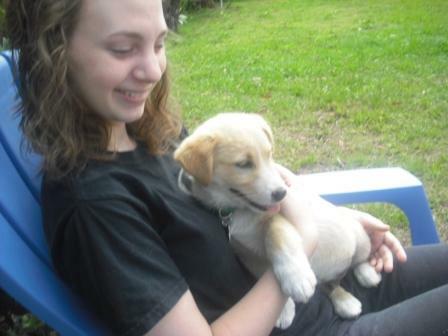 Popcorn is a 10-week-old Yellow Lab/Great Pyrenees puppy that I just started fostering. He is pretty much full of himself,always wanting to wrestle and show off. Chutney is forever putting him in his place. It is hysterical. I made this video of Popcorn and the other puppies. My favorite moment is 1:37 when Chutney gets sick of his antics and tosses him across the yard! That’s my boy!!! so named because – although he’s starting out a timid, withdrawn orphan of a dog – given time and patience, he’ll show us the corgi “magic” hidden inside! I visit Harry Potter, a 4-year-old corgi/Australian Cattle Dog mix at a rural North Central Florida animal shelter. An owner surrender (the excuse was too many dogs), this boy weighs 26 lbs. and – wonder of wonders! – is heartworm negative. Inside the shelter, Harry is excitable and anxious, looking up at the ceiling, running in circles, and barking anxiously at the noisy old ceiling fan above his pen. 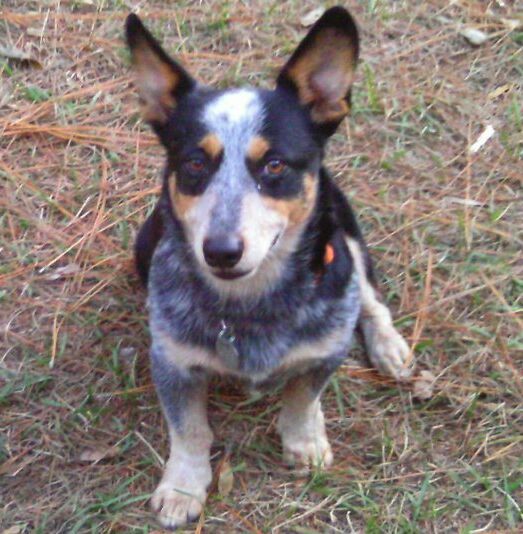 He looks like my Pembroke Welsh Corgi – in ACD clothes! His coat, which has the colors and pattern of an Australian Cattle Dog’s, is tighter and sleeker than most corgis I’ve seen. Harry reminds me of Chicken Little the way he’s running in circles and staring at the sky. In any case, he’s been barking so much, he’s hoarse from the effort. We head outside to the play yard, where Harry is friendly and people-oriented, eager for attention and affection. He needs a chance and TDL is going to give him one! The ride home is uneventful; Harry sleeps in his crate like a champ. Harry Potter meets my pack: Chas, the border collie/Labrador retriever; Scout, the whippet/JRT; and Shelby, the Pembroke Welsh Corgi. He’s aloof and stand-offish, clinging to me and following me wherever I go. Contrary to typical corgi behavior, Harry doesn’t bark or run or play. The only thing he wants to do is sleep and be right by my side. Whenever the other dogs approach, he growls and places himself between me and them. I correct him appropriately and I think he’s starting to get the idea that: 1) my dogs aren’t too worried about what he thinks and 2) I’m not going to put up with it anyway. My feeling is that he’s just insecure and exhausted from his 1-month plus stint at the shelter. 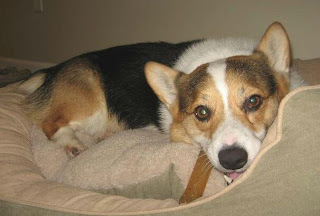 Let’s face it, being in a noisy shelter right underneath the loud, non-stop squeaking of a ceiling fan for a month is a lot for any dog to take, especially a corgi. Corgis tend to be excitable – we corgi people say “enthusiastic” – and active dogs. Harry probably never stopped barking and running in circles while he was there – the shelter staff told me that’s what he was known for! I can’t wait to see him tear off across my yard after a squirrel, barking at the top of his lungs (Holly warns me I will eat these words). I know there’s some corgi “magic” in there somewhere. For now, however, Harry sleeps. He has made friends with my two smaller dogs, but still growls at Chas, the border collie/lab mix. 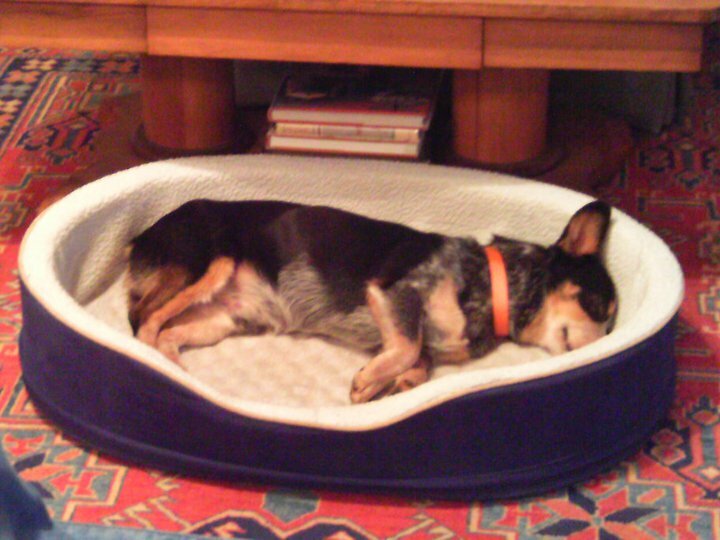 I suspect he’s intimidated by Chas’ size and the fact that – easygoing and laid-back as he is – Chas is the pack leader. I have a feeling they’ll come to an “agreement” one way or the other. I’ve decided to turn them out together to sort it out on their own. Note: Harry has shown some resource aggression toward other dogs with respect to food and toys. I separate my dogs at feeding time; Harry goes into his crate to eat. He growls and barks at the other dogs if they approach his crate while he’s eating. The good news is the longer he’s here, the less he does it. (He has never shown aggression toward people; in fact, I take his food and toys away from him on a regular basis to remind him who’s boss. He always just rolls over on his back.) For this reason, however, I would recommend that Harry go to a home with no small children. Like most corgis, he needs to know who’s boss and sometimes those lines aren’t so clear when little ones are involved. After three days of silence, Harry Potter finally found his voice! He’s outside running around and playing with my corgi, Shelby. They spotted a cat when I turned them out for the last time tonight – that was all it took! My neighbors may not appreciate all that obnoxious corgi barking, but it’s music to my ears. Better still, Chas and Harry seem to have come to some sort of a truce. Life is good! Breakthrough! Harry Potter was actually grooming Chas this morning. Prior to this, these two weren’t on speaking terms. This means Harry has an even greater chance of being adopted into a multi-dog household. He’s learned that he doesn’t have to be top dog – it’s a good thing! Harry Potter has come so far in his acceptance of other dogs. 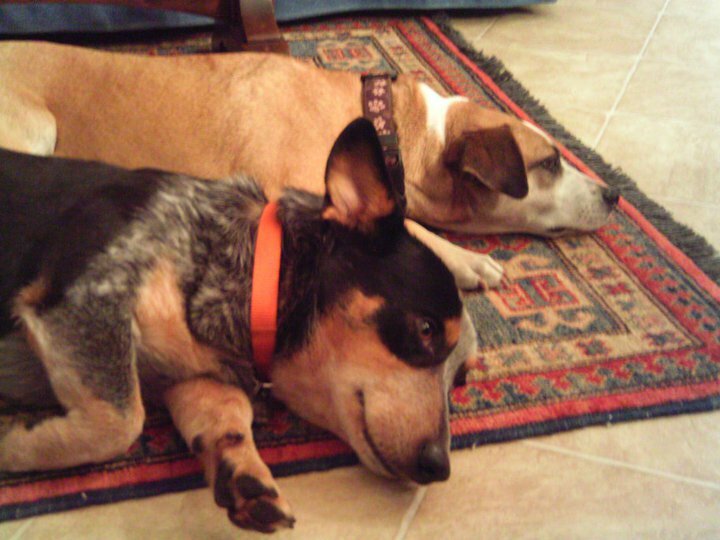 Due to limited foster availability and a huge influx of dogs, I now have two additional fosters – Cardigan Welsh Corgi sisters Piccadilly and Penny Lane. My mom is having her annual Christmas Party bash this weekend, and, as a result, has asked me to keep her two dogs, Holly (border collie/shepherd mix) and Itsy Bitsy (Pembroke Welsh Corgi) until Sunday morning. That’s a grand total of eight dogs here at my little three-bedroom, two-bath bungalow! Thank God my mom’s party is over Saturday night and she picks up her dogs the next morning! In any case, Harry has taken this sudden doubling of our numbers in stride. He greets everyone with the same curiosity and shows absolutely no aggression. This tells me he will have no trouble in a multiple-dog household (I mean, who actually OWNS and LIVES with eight dogs, right?). 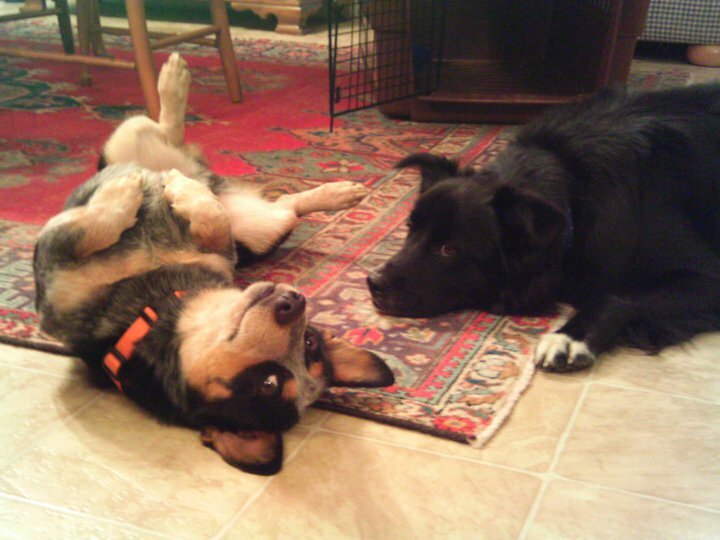 Harry has accepted and now plays regularly with Chas, my border collie/lab mix he originally did not like. He does have a special affinity for the ladies, due in part, I think, to the fact that he was four-years-old when he was neutered. I know he would be especially pleased to be adopted into a house with at least one other FEMALE dog, as he has grown particularly fond of Scout, my female JRT/whippet mix. I believe Harry thinks he is flirting with her – he licks her face and gnaws on her cheeks and ears. I guess that’s courting to dogs – I’ll stick with flowers and jewelry, thank you very much! Harry Potter is a lover of a dog! He has become such a sweet boy, blending so nicely into my pack. He gets along just fine with my dogs – still guards his toys, so I guess that’s his “thing” – but no longer growls at the other dogs over feeding time. I separate my dogs at feeding time – no free-for-alls here! – and I think Harry has accepted that his food is perfectly safe and no other dog is going to take it from him. HE HAS NEVER GROWLED AT OR ACTED ANY WAY OTHER THAN EXTREMELY SUBMISSIVE TOWARD ME OR ANY OTHER PERSON. I wanted to make that clear because I believe some folks may have gotten the wrong idea after reading the early entries of this blog. I take Harry’s food, treats, toys, etc. away from him on a regular basis and he offers absolutely no resistance. If he’s doing something I don’t want him doing, all I have to do is snap my fingers and he stops in his tracks and comes right back to me. Harry’s greatest desire is to sleep at your feet. No kidding! If I’m in a chair, he’s right beside me. He sleeps next to my bed. If I go to another room, Harry Potter’s hot on my heels. This is a dog that will follow his human to the ends of the earth. One kind word and a scratch behind the ears and he’ll be yours forever! Just a note about bath time: Harry loves warm soaks in the tub! Who knew? When I bathed him earlier this week, he enjoyed it so much he actually sat down and closed his eyes! It makes me cry, too, because I remember the Harry the Amy described to me the first time she got him, the dog who was spinning underneath a ceiling fan, hoarse from barking, with no purpose in his life. Amy saved him. She truly saved him! She turned him from a nervous shelter dog into a loving family pet who this evening walked out the door on a leash being held by a 2-year-old. And that, my friends, is why we do what we do! 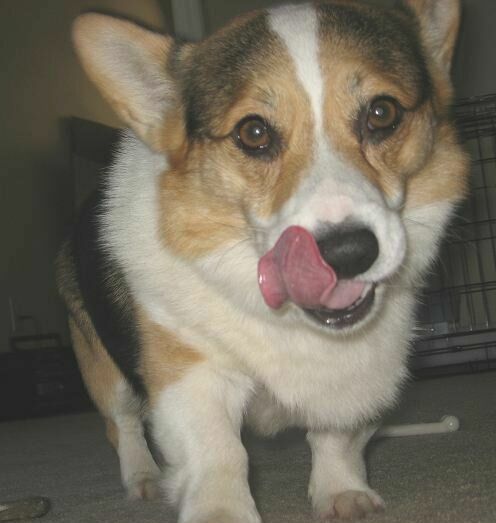 Meet Bucky, a three-year-old Pembroke Welsh Corgi. 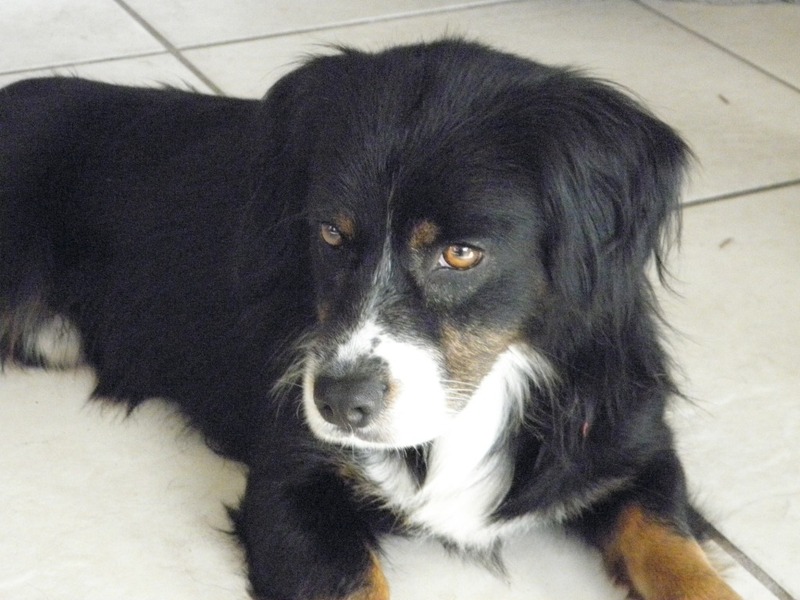 Just 25 pounds, he is a very playful fellow, good natured and affectionate. Well, of course he is ~ he’s a corgi! He walks well on a leash which is a good thing, otherwise he wouldn’t be able to resist chasing squirrels. He’ll chase a ball too, but good luck getting him to bring it back. Bucky does very well with other dogs but he tends to bark at and chase cats. He doesn’t chase them with a bottle of ketchup, we just think they are a new experience in his life. Needless to say Bucky is friendly with both adults and kids, but since he tends to jump up, little ones may find themselves on the ground. Also, like a lot of dogs, he’ll nips when playing, something that little children don’t understand. So perhaps Bucky needs a home without toddlers, or at least very resilient ones! A handsome Corgi in his tri-colored coat, Bucky likes to hang out on the couch playing with his squeaky toys. No doubt he will make some family very happy! You can see more photos of Bucky on his Facebook photo album. Becci has brought Bucky Home! Bucky – now Buck – is on his way to Cocoa, Fl with Becci and Rescue. He was thrilled to have a dog to play with since the kitties wouldn’t oblige. It’s obvious that Becci will be a great mom and hopefully he won’t try to herd Rescue too much. Ohh we are doing wonderfully!! Just back in from a nice walk by the river. Buc went Monday to the groomers everyone loved him of course. Tuesday he got a physical from our vet & everything looked great & again he melted hearts. Rescue’s acting more like his old self now that he has Buc around. He actually runs & plays around the yard again. I truly thank you for rescuing this cute lil guy, he’s made himself right at home & we are all crazy about him. Imagine walking through a flea market and seeing someone selling puppies, then finding out that he’d started the morning with eight, ended with four, and those he is dropping at a kill shelter on his way home. That’s what happened last weekend in Georgia. This woman was a person of action. She paid the man for the puppies and brought them to Connie at Bark N Ride. Connie got in touch with Hope, who volunteers tirelessly to find rescues that will take Georgia dogs. Hope got in touch with Gisele on Monday, who said we’d take them. Tuesday Hope scrambled to put together a transport. Wednesday Adrianne drove all day to get them to us, and Meg met them in Oviedo at 9pm to bring the puppies the last leg to me. Thursday I brought them to Aloma Jancy Animal Hospital who made room for them to be spayed and neutered. And now they are ready for their forever home. Whew! Welcome to the fast paced world of rescue. You can’t imagine the hours, cost and emotional energy that went into the rescue, and yet this rather routine for us and the absolute norm for Hope! Hope spent over $1000 on this rescue just getting them to us. She is one of the unsung heroes of rescue. 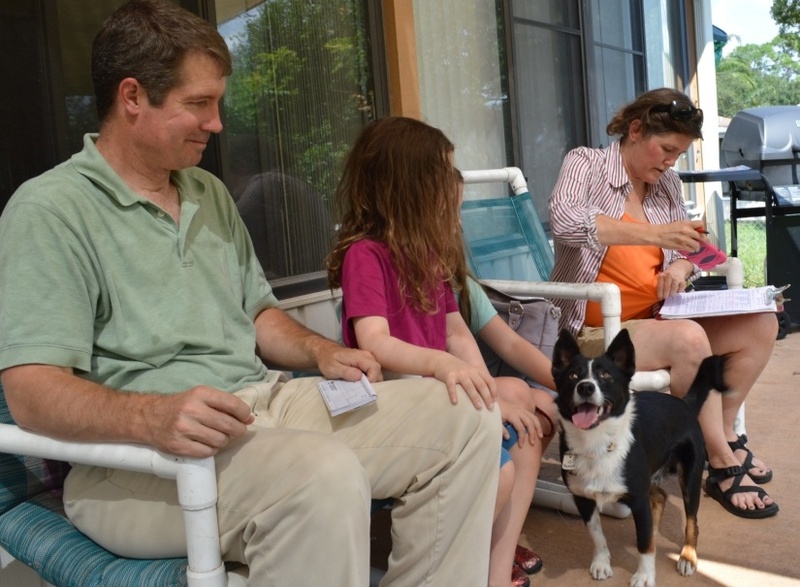 When we find a home for a dog, the family tells us how wonderful we are, etc, but people like Hope, Connie, Adrianne and Meg don’t get that moment to help carry them forward. Without them we truly couldn’t do this, so I pray they know how appreciated they are! I’ll take this moment to invite you to read a previous blog that I posted on adoption fees. What can I tell you about these pups, beside they are about the cutest things I ever did see. Take into consideration that my personal dogs are Basset mixes ~ I guess I have a thing for stubby legs. 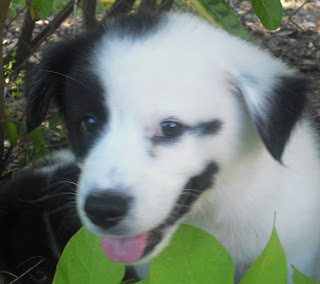 You see, when we were contacted about them, we thought they were Border Collies. But then when they stumbled out of their crates and into my living room, we started to giggle. Three of the four have very short legs. And somehow it works for them! Surely the mother was a Border Collie. In Button’s case, I wouldn’t be surprised if the father was one too. But the other three? Well, I suspect that the father was a Corgi (you did know that litters can have multiple fathers, didn’t you?). That would make them Borgis. Yeah, I know, but it really is a designer breed. lol They all have fluffy fur and very sweet demeanor. But what do you expect in 12 week old puppies? 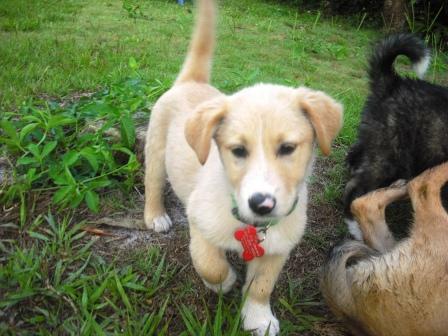 Whoever adopts these puppies has to promise to send me photos of them when they grow up! In the meanwhile, we can all enjoy what I have posted on their photo album. If you are interested in these or any of our dogs, please read about our adoption process. The Borgis are really coming into their own. When they first arrived they were happy but a bit tentative. I kept them separated from the other puppies because I didn’t want to have them get overwhelmed, but now they are all in! I laugh as I watch them wrestle with Catahoulas Chip and Dale, or sneak up and pounce on Dixie the Shepherd. My Ralph and Gus are wonderful with them (of course!). Ralph likes to mother them, whereas Gus likes to play hard. All of my friends who have met the Borgis have had the same first initial reaction ~ they laugh! You just can’t help it as you see them trudging along on their squat little legs. My daughter says that they remind her of the dwarves in Snow White. Maybe, but they’re a lot cuter! Bear was adopted on August 1st by Joleen and Dwight. Their little 8 year old Jack Russell died suddenly last month, probably as a reaction to her annual shots. You can imagine how hard that was for them? They thought they’d wait at least a year before getting another dog but quickly found out how quiet their home was without one (lots of us have been there!). When they saw Bear’s photo they thought that maybe this would be the one. And when they met, yup, the one! We just wanted to give you an update on our guy. He has been such a joy to have around and alot of fun. He has started going to the doggie park and absoultely loves his new friends. They play so hard that they all go home and sleep for hours. Bear is enjoying his morning and evening walks; the whole neighborhood has to come see him or stop there cars to say hello. He is hurt when they do not. 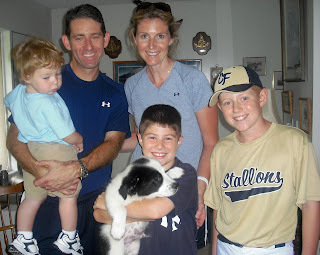 He is definitely a very well demeanored and extremely friendly guy, we couldn’t have asked for a better dog. He is getting bigger, 2 weeks ago he weighed 16.7 lbs at the vet. He is also realizing he has a voice, he will let you know when he wants something and he is definitely not shy about telling you. He is also very smart, potty training him was extremely easy. He sleeps in our room on his own pillow. He has learned a few tricks already. I could go on and on about Bear, he truly has brought back some happiness and joy that we lost when our other girl passed away. Thanks so much and we will send some future pictures of Bear as he grows up or I should say grows longer. I don’t think he will get much taller. Baloo was adopted August 13th. 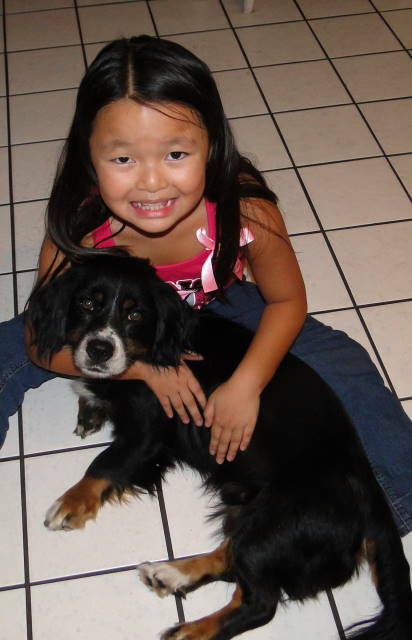 In May, Sloane and Harran’s 16-year-old cocker spaniel died. It was a hard loss because she had been their first baby, but she never really accepted the children when they came along. 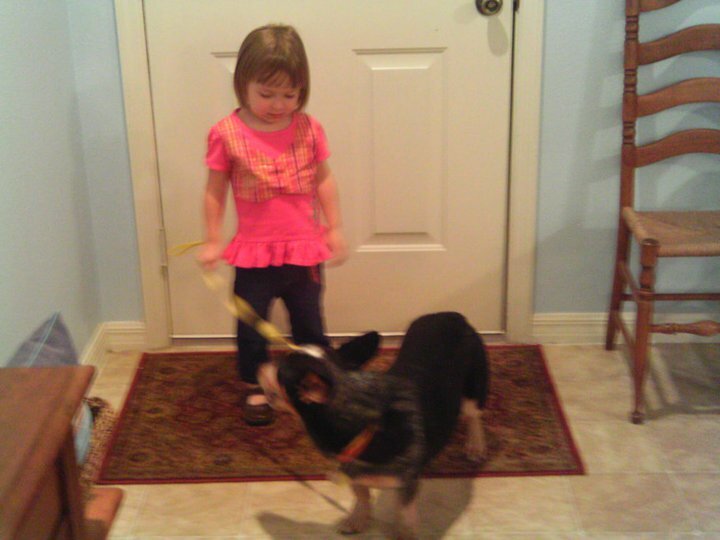 When Sloane first contacted me, she said her number one priority in a dog was that it like her kids. No problem ~ Baloo adores them! This busy family is going to throughly enjoy their busy little puppy. Baloo is now “Cubby”. He’s doing great! The kids love him and he and the baby are best buddies. They love to wrestle. We have very few accidents–you did a great job with him!! I saw the picture of his brother on Facebook, so I thought I’d give you the update. Boo was adopted August 18th by Vanessa. She had done her research and knew the personality she was looking for. When she met Boo, it was an instant connection! Boo will be the center of attention in Satellite Beach! So happy!